The Kaiser Permanente Community Fund (KPCF) at Northwest Health Foundation was founded in 2004 with an initial $28 million investment by Kaiser Permanente to improve conditions for health. As we learned how to best partner with community organizations, we made pivotal decisions that changed how we operated. In this story, we tell how Latino Network taught us to focus on the roots of health, even when it pushes us out of our comfort zone. Children participate in Latino Network’s Juntos Aprendemos program. In the late 1990s, Latina mothers in Portland had clearly articulated the racial opportunity gap in early learning and had a vision for how to eliminate it for their children. When Sadie Feibel, director of Children, Family and Community Services at the Latino Network, heard this frustration and determination voiced by many families in her community as they struggled with the transition into kindergarten, she and Christine Taylor, a community health nurse, responded. They brought Latino parents, children, and educators together to build bridges between the community and its schools. And so, Juntos Aprendemos (Together We Learn) was born. The culturally specific, dual generation early learning program prepares young children to succeed in school and supports parents to be their children’s first teachers and strongest advocates. When KPCF first started, we funded programs focused on equity in healthcare, such as delivering culturally competent care. We did not connect our vision for health to programs like Juntos Aprendemos. As we learned from our community, as well as from the growing public health conversation about social determinants, we realized how important childhood and education are for life-long health. “We need to start creating the conditions for success as early as possible. 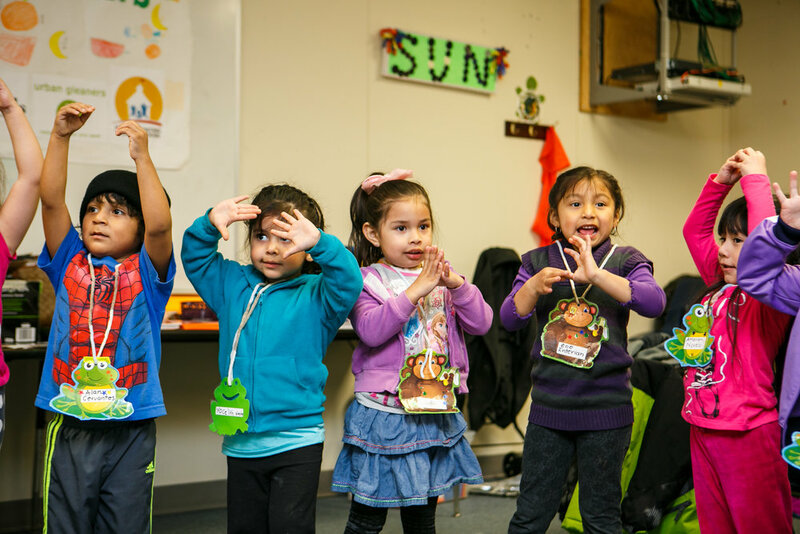 When kids start kindergarten ready to learn, they do better in school and can graduate with the knowledge and resources they need to be healthy adults,” said Northwest Health Foundation Community Engagement Officer Michael Reyes Andrillon. Health and hospital systems weren’t used to funding groups like Juntos Aprendemos, and doing so took us out of our comfort zone. We weren’t familiar with the nuances of early childhood and education, nor were we a part of existing networks and collaborations focused on these issues. We needed to adapt to become an effective funder in this area. “As we grew, we learned about the entire ecosystem that allows students to be successful in school. School districts are incredibly complex; funders and community partners need to support families as they navigate bureaucracy and advocate for their children,” said Michael Reyes Andrillon. While not easy, these changes allowed us to be a better community partner, as illustrated by the collaboration between KPCF and Latino Network. Over the past three years, we have supported the growth and expansion of Juntos Aprendemos. What began as a pilot at one elementary school has now expanded to twelve schools, serving over 1,600 children and parents since the program began. These children and parents are now better able to succeed in school, advocate for themselves, and create healthy patterns of development. The successes of Juntos Aprendemos show what is possible when funders step out of their comfort zones. Through funding this program, we learned new approaches to creating health in our communities and invested in developing partnerships and networks. We worked to identify great programs led by community members, and instead of asking them to navigate our funding, we changed our funding to best support them. Through thoughtful listening to learn what works, KPCF was able to develop new approaches to amplify the change that is happening in communities, making investments for more effective and long-lasting change.